Graphical representation of what a Presidential Alert will look like on cellular phones. At 2:18 PM on October 3, 2018, the Federal Emergency Management Agency will test the Wireless Emergency Alerts system. This will be the first test of the presidential alert system since the introduction of wireless emergency alerts. The alert message will appear similar to a text message, but will have a unique sound and vibration. 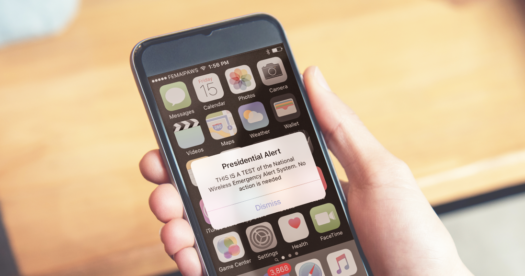 The alert will sound and appear the same as other wireless emergency alerts, but will have a Presidential Alert header. The test alert message will be “THIS IS A TEST of the National Wireless Emergency Alert System. No action is needed”. Most phones should receive the alert, but some may not. The alert will be broadcast for 30 minutes after the test begins. The alert should be displayed only once within that time frame. If the alert is not received before the test ends, it will not be displayed. Phones that are powered off for the entire duration of the test will not receive the alert. Presidential alerts are designed to allow the President to address the nation within 10 minutes. They can not be disabled, but the alert can be silenced once it is received. All other wireless emergency alerts can be disabled. The national Emergency Alert System will be tested at the same time as the wireless alert system. This is the third nationwide test of the Emergency Alert System. The EAS test message will be broadcast by television stations, radio stations, satellite providers, and cable providers. State and local governments already use these emergency alert systems to inform residents of severe weather, missing children, and other threats to life or property. This system test was originally scheduled for September 20, 2018, but was postponed due to Hurricane Florence. More information about this national test can be found at https://www.fema.gov/emergency-alert-test.